*Online Resource O Christ, Lamb of God (Richard Bruxvoort-Colligan) A more modern Agnus Dei, with Christ sharing our weakness. Lyrics and sound sample. *Sing Alleluia / Fresh Sounds 041 Jesus Lamb of God (Betty Pulkingham) This is one of my absolute favourite Agnus Deis (what's the plural of Agnus Dei?). A little bit of the tune. Good for kids. *ATAR657 Jesus, lamb of God (Robin Mann) A nice new Agnus Dei. Quite simple to sing. Online Resource Lamb of God you take away the sins of the world (Jane Southwick Cool) A very simple and beautiful Lamb of God. Sheet music (look for the PDF symbol) and lyrics. *ATAR648 / Online Resource Lamb of God you take away the sin of the world (Kevin Keil) A simple and quite lovely extended Agnus Dei (written for Advent, but I think you can sing it in Lent also), with extra verses of Morning Star, God with Us, Prince of Peace… Sound and sheet music samples, and download options. *Iona (CAYP) / SP228 / URW413 / StF790 Lamb of God you take away the sin of the world (John Bell) I really like this one (St Bride setting). A simple, and quite meditative overlapping cantor and response. It will need to be taught, but it will not take long for people to pick it up. Keep it slow. Sound sample. AoV1-196 / GC171 / GC(II)152 / RS 329 Jesus, Lamb of God (Agnus Dei) (Marty Haugen) from the Mass of Creation, so particularly good if you are using that entire setting. Sound sample and lyrics. GC213 / GC(II)319 / RS 469 / URW414 Jesus Lamb of God (Michael Joncas) from his Psallite Mass. Sheet music sample. GtG603 Lamb of God (Paul Vasile) This is really nice; will need to be taught. Jazzy chords! Sheet music preview. 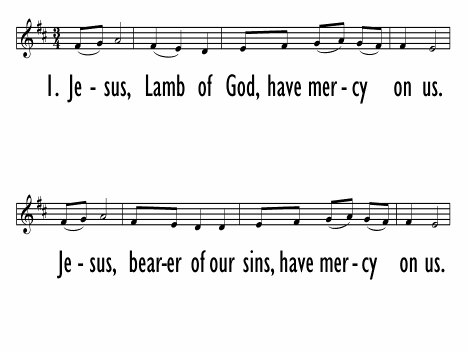 GC(II)174 Jesus Lamb of God (Agnus Dei) (Richard Proulx) A simple chant. Cantor and response. AHB 448 Holy most holy Lamb of God (Daniel T Niles) Funky Philippino tune. Yeah, something groovy in the AHB! Music by Heart 06 Lamb of God (Robinson McClellan) A simple, and quite lovely call and response. This would be very easy to sing even if new, provided you have a good song leader. Good for kids. CH778 Lamb of God you take away (Fride Gustafsson) A very simple Agnus dei. Easy to sing. 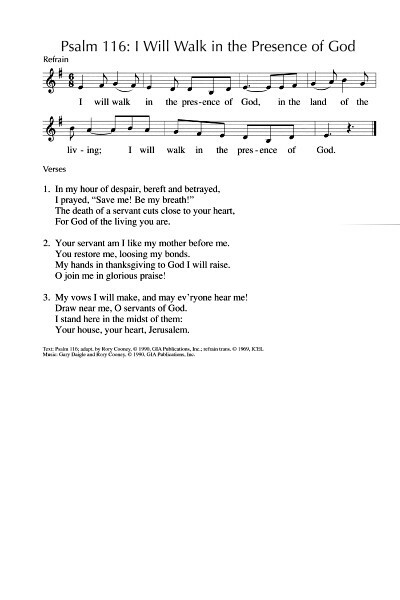 GC(II)318 / G(3)392 O Lamb Of God (Robert Batastini) Quite lovely and soothing call-and-response Agnus Dei. Sound sample. WoV621 Lamb of God you take away the sin of the world (Marty Haugen) A canon. In 3/4. Seems quite nice and simple. Iona (T1AU) / CH790 O Lamb of God (John Bell) St Bride setting. Nice; will need to be taught before you use it. It's a little bit tricky. The word became a song Jesus Lamb of God (Robin Mann) Quite simple. Good for communion. Recorded music Agnus Dei There are very very many classical versions of the Agnus Dei. It might be nice to play a recording while communion is distributed, or while people light candles for their prayers. Some favourites: Agnus Dei set to Samuel Barber's Adagio; I also like Palestrina. And Dunstable. A vow to the Lord, and lifting the cup of salvation…? Linnea Good Psalm 116 (Linnea Good) is particularly beautiful and simple “I love you God; I know you listen. You listened on the day I cried. When I called out to you in anguish, you were my presence and my guide”. Unfortunately, I'm not sure how to access this if you don't already have a copy. Good for kids. PfAS116D I love the Lord who heard my cry (Isaac Watts) This uses just the first line of the old Watts hymn, with inclusive language, as a Psalm refrain. Nice. Oldy-but-a-goody. URW311 I love you Lord you hear my cry (Isaac Watts) A simple song with two verses, or you could use it as a Psalm refrain with the text read by a leader. It would be pretty amazing if you can sing it in 4 parts, I reckon. The 2nd verse could be quite appropriate on its own during intercessions. Lyrics (more verses). TiS 709 / Taizé Chuyo chuyo (Jacques Berthier) A Korean hymn, appropriate for an intercession response. Not hard for non-Koreans! means "Lord hear us". TiS 727 / SiS361 / ATE 208 / CH121 / AA70 / PfAS022F In the presence of your people (Brent Chambers) A good Yiddish tune - lots of fun for kids and adults. Good to get fast and dance around on this one, but maybe not for your typical Maundy Thursday service. Good for kids. Or you could try:*VU745 In the presence of your people (Chambers - refrain only) Refrain only for singing with a reading of a different Psalm, but it would also work for this one. You might also like to look at the Communion songs page. 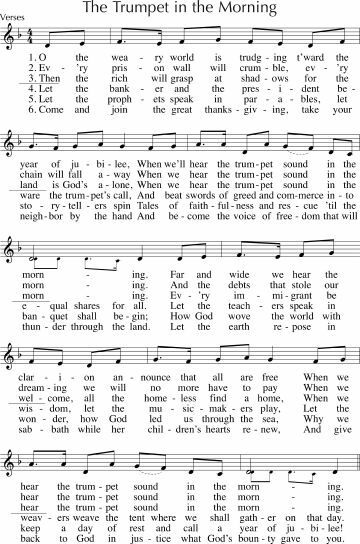 *Praise for all Seasons I Remember (David Brown) Our musicians sang this in 2014 while people are moving in to the space for communion "I remember a man who came for his last meal, ate it with a group of friends and it changed the world". *AoVNG15 Bread of Life (Michael John Poirier) A nice gentle song. Would be good for distribution of communion. Particularly good for Maundy Thursday. Our musicians sang it a couple of times in the last few years, and it was just lovely. I think we could just do it again! *GtG207 Sharing Pascal bread and wine / Shadows lengthen into night (Mary Louise Bringle) Maundy Thursday A great song for a Tenebrae service, with the chorus "Shadows lengthen into night", but could work for other services too. *CH763 / MV193 God bless to us our bread (Frederico Pagura / Traditional Argentinian) A lovely simple grace for meals and for communion. More Voices has Spanish and French lyrics as well as English. "God bless to us our bread, and give bread to all those who are hungry, and hunger for justice to those who are fed. God bless to us our bread". Sound sample (Track 1). Good for kids. *ELW466 / FFS38 / SFFS 2255 / GtG533 In the singing in the silence (Shirley Murray) Lovely words, simple tune in FFS; there are quite a few tunes to this. Lyrics and single-use only downloadable PDF. NCH344 / Iona (Enemy of Apathy) / GA385 / G(II)611 / Lau638 The time was early evening (John Bell) Great words to a familiar Celtic folk tune. We used to sing this one often on Maundy Thursday; would be good to revisit it. "Oh the food comes from the baker, the drink comes from the vine..."
ATW 472 / NCYC'99 As we take this bread (Jane Dyson) A lovely simple communion chant. Good for kids. VU458 / AA017 / W&R276 Christ let us come with you (Shirley Murray) Tune in AA is simple, but not familiar. Good song for Maundy Thursday and the last week of Lent. Lyrics and sheet music. TiS 707 / Iona (Common Ground, LFB) / A&M429 / SP214 / StF576 Bread is blessed and broken (John Bell / Graham Maule) Very simple. Good for distribution of communion; not all versions are inclusive. Lyrics. TiS 357 / ATA 147 When his time was over the palms lay where they fell / When our life began again (Robin Mann) Beautiful and mournful. Lyrics. BUC Song Project Harvest our love (Dave Brown). This song is just perfect for every communion service ever. It would be good to sing this again, because it's been a while. Jazz. ATA 135 / VU132 Bitter was the night (Sydney Carter) Lyrics based on Peter's denial of Christ. Lyrics and sheet music. Iona (T1AU) / Cha430 Lo I Am With You to the end of the world (John Bell) Simple repetitive verses, in a nice minor key. Sound sample (youtube). ATOK 397 / Iona (LFB) / CH658 / VU462 / A&M426 / GtG428 / CP610 / Cha391 / SP211 / StF575 Before I take the body of my Lord / These I lay down (John Bell) A pre-communion confession. Lovely tune which is easy to sing. Lyrics. Taizé / TiS 714 / AoV1-125 /ATE 270 / CH661 / UMH628 / VU466 / WoV709 / ELW472 / GtG527 / GA205 / A&M442 / G(II)588 / GC838 / GC(II)806 / G(3)941 / RS928 / CP063 / W&R697 / Cha414 / SP229 / URW379 / Lau633 / StF583 Eat this bread drink this cup (Robert Batastini) Excellent, particularly if you have a capable cantor. Some resources say "Come to him and never be hungry", but others have "come to me / trust in me". *ATW 478 / Iona (T1AU) / CH799 / A&M469 / G(3)951 / SP230 / URW420 This is the body of Christ (John Bell) A very simple and gentle chant for distribution of communion "This is the body of Christ, broken that we may be whole; This cup, as promised by God, true to God's word, cradles our Lord: food for the good of the soul." Note, I did a sneaky little lyric change there... see if you can find it. CH484 / UMH579 / WoV666 / ELW358 / A&M169 / PH353 / CP442 / CP(E) 133 / W&R55 / SP57 / URW087 / StF499 Great God Your Love Has Called Us Here (Brian Wren) Good words to a standard hymn tune (MELITA). Gathering, confession, response, communion, and sending out all in one hymn. This is a good all-rounder. New words to old tunes. STB297 Broken communion tore you apart (Junchol Hong) A simple and solemn Korean chant, including a section that is just hummed; the two sections could be sung at the same time. Can be sung in English or Korean. On the road Mystery of servant love (Ross Langmead) Excellent song, with much feeling about Christ's suffering, death, and servanthood. Recorded Music The basin and the towel (Michael Card) Excellent lyrics about how this story lives again every time we "wash the feet" of others. You could play the song, or ask your musicians to sing it. Thanks to Pam Purdin in the Facebook group for suggesting this song. Lyrics. Youtube. Sheet music. 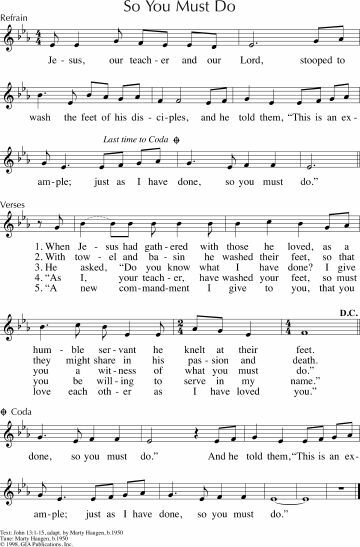 GC(II)431 / G(3)507 Jesus our teacher and our Lord / So you must do (Marty Haugen) A nice song for the musicians to sing during foot-washing; it's not so easy. Lead sheet. Sound sample. *BUC Song Project The night is dark and lonely / In Darkness (for Maundy Thursday) (Julia Potter) A lovely chant that can be sung as a round. It will need to be taught; once you get it, it's mesmerising. *Iona (The courage to say no) / CH371 / StS085 Lay down your head Lord Jesus Christ (John Bell / Graham Maule) This song would be good for the end of a Maundy Thursday service, particularly if sung simply by a soloist if it is not familiar to your congregation. "What lies ahead we fear to guess… Lay down your head and, by your side, we'll sleep and stay".We sang this a couple of years ago. Iona (T1AU) / Cha430 Lo I am with you to the end of the world (John Bell) Simple repetitive verses, in a nice minor key. Taizé / AoV2-088 / ATOK 395 / CH793 / VU950 / ELW348 / GA325 / A&M172 / SFFS 2198 / GtG204 / W&R286 / SP61 / Lau249 / StF780 Stay with me / Bleibet hier (Jacques Berthier) A very well known chant. Sheet music and sound samples. Taizé / ATE 287 / WoV667 / GA321 / G(II)298 / GC411 / GC(II)433 / G(3)502 Stay here and keep watch (Jacques Berthier) Not very well known, but very good for the end of Maundy Thursday. Most would use "Stay with me, remain with me", but this is a nice alternative. Taizé / CP194 / URW392 Stay with us / Bleib mit deiner Gnade / Night will soon fall (Jacques Berthier) Another good one from Taize. The phrase "Night will soon fall" is particularly appropriate for Maundy Thursday. Sheet music and sound samples. VU182 Stay with us through the night (Walter Farquharson) Simple and gentle sorrowful, but hopeful song. AoV2-024 / URW407 Holy Darkness (Dan Schutte) Beautiful words based on John of the Cross. Might want to use a cantor if this is not familiar to your congregation. URW has only the refrain. Lyrics and sound sample. Share your ideas - what will you be singing? What did you sing this year? Post a comment below.